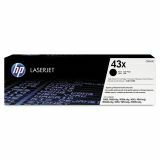 HP 43X, (C8543X) High Yield Black Original LaserJet Toner Cartridge - High-yield toner cartridge is designed for use with Hewlett-Packard LaserJet 9000 Series printers, including 9000, 9000n, 9000dn, 9000hnf, 9000hns, 9000mfp, 9040, 9040n, 9040dn, 9040mfp, 9050mfp, M9040 MFP, M9050 MFP, 9050, 9050n and 9050dn. Microfine toner produces clear, sharp results. Smart technology tunes particle charge for reliable results. 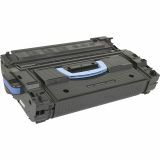 Cartridge yields approximately 30,000 pages in most of these machines and approximately 38,000 pages in 9040mfp and 9050mfp. 23.43" x 15.59" x 7.80"